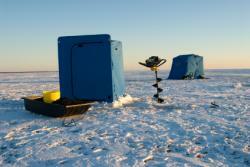 When you spend time out on the open ice, a backpack ice fishing shelter is essential so you can weather the elements as you enjoy waiting for the fish to bite. While ice fishing houses are permanent, ice fishing shelters easily fold, are compact, and can be transported along with your backpacking gear. Folding - This is a lightweight, aluminum frame shelter, with an easy and quick set-up. ATV Mounted - For those owning an all-terrain vehicle, this shelter attaches to back of your ATV. Portable, but heavy - The Frabill Predator Portable Shelter is one example of this type of shelter, and it sells for about $700. It sets up quickly and folds easily, but a sled is needed in order to transport its 153 pounds. Flip-over - This style has a base that is like a tub or a sled. Setting it up requires you to flip it over onto its base. Then, the sides are constructed. Some models have room inside for a portable heater. Homemade - Just as the word states, these models are custom-made in one's home for the purpose of taking out onto the lake for fishing. There are various plans on the Internet, or ways to order plans for creating shelters. Sometimes the shelters made at home work just as well as the products on the market. Ice fishing shelters are easy to carry. Load up your fishing shelter, rods, bait, tackle, and chisels and prepare to head outdoors for your ice fishing adventure. You may want to consider purchasing a made-for-fishing backpack to carry all your fishing essentials. This way, you will have special compartments for each of your supplies. 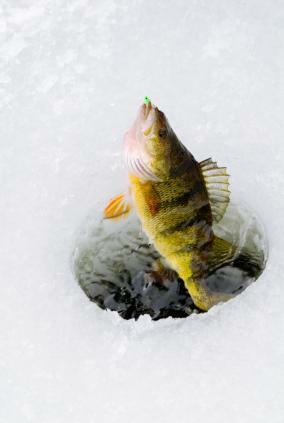 Be safe, catch lots of fish, and stay warm!